You should all be aware now that Microsoft are upping the price of Xbox Live Gold by $10 per year, or $2 per month depending on what package you choose or where about’s in the world you are. But for those of you who wish to get a cheap month before the price goes up — check out this offer that costs just $1. No, stop rubbing your eyes, this deal is real. 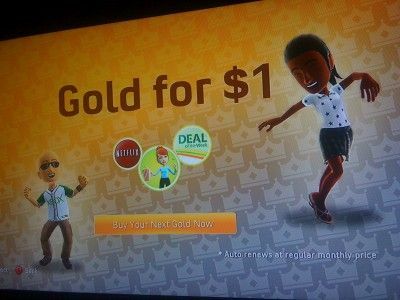 If you head over to your Xbox dashboard now you will see Xbox Live Gold Membership available to you for only $1. Although, if you do take up this offer, remember to cancel it before the new price comes into force otherwise you will be charged at the new rate. I think this deal will be ideal for newbies to the Xbox Live Gold experience. I suppose Microsoft wants to give gamers a chance to see if they like it or not before they commit to paying a subscription to a service they may not even use that much. But it seems as though Microsoft are fighting an uphill battle. Sony already offer the free PSN service to gamers, with the option to upgrade to PSN Plus if they want, so the reasoning why Microsoft are upping the price is unknown. So, as we said, if you are new to the world of online console gaming, give this offer a go by heading to your Xbox dashboard and following the on-screen menus. monthy how much?????????????? 4 gold???????????????? ?